After the success of our first Church Weekend Away in 2017, we are excited to invite you to join us once again at Avon Tyrrell for Rooted; taking place from 13-15 September 2019. The weekend is aimed at growing us as disciples and as a grace-filled community. Everyone who sees (or wants to see) Highfield and St Denys as their spiritual home is welcome to join us. We are delighted that the Rt Revd Mike Hill (former Bishop of Bristol) will be coming to speak to us as we continue to explore the roots of our vision trees – the values that shape who we are as a church. In addition to teaching, there will be worship for adults, children and young people at different venues, as well as time to relax, explore the site, use its facilities and enjoy being together. Once again there is a range of accommodation available, from staying full-board in the house through to self-catering camping, and with Avon Tyrrell situated just 45 minutes away by car, it’s easy to join us as a day visitor if you’d prefer. This year's brochure, detailing all that you need to know before booking your place, is available to download via this link - look out for some of the 'new for 2019' features. To calculate the cost for each person in your party choose the ticket type and then add on your chosen accommodation and any optional extras. Click here for the booking form, opening Monday 1 April 2019. Delegates can secure their place now by completing the booking form and then paying the full fees. Bookings close on 14th June. 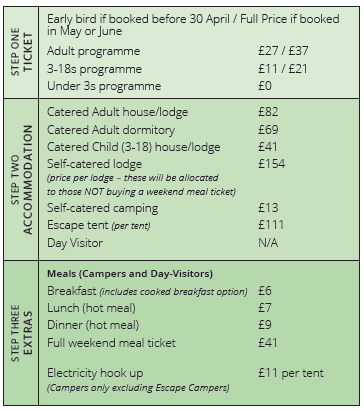 Children and youth team receive free meals if booking self-catered accommodation, or the cost of a weekend meal ticket (£41) deducted from their booking.